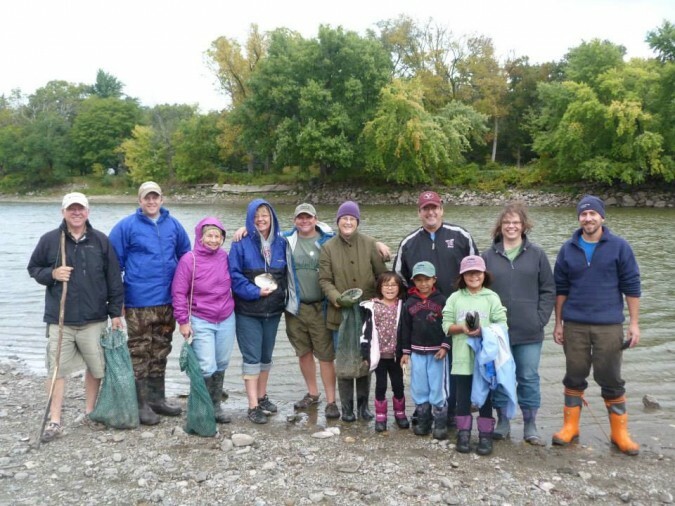 A group of 16 river enthusiasts gathered at Memorial Park on the Minnesota River in Granite Falls this past Saturday for a Mussel Field Day with Bernard Sietman from the MN Dept. 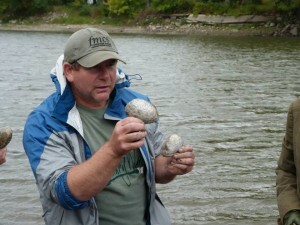 of Natural Resources, one of two specialists in the state of Minnesota that work with freshwater mussels. His knowledge and passion for mussels is so inspiring. Bernard presented the group with a brief history of mussels. Who knew that freshwater mussels were the most threatened animal in North America. Minnesota is the home to 50 of the 300 species found in North America, with 2 of those (50) extirpated and only the presence of their empty shells verifies that they once lived in the waters of Minnesota. Their demise is due to the degradation of habitat (sedimentation from soil erosion) and pollutants in our surface waters. Also, there was a large button industry and overharvesting of the mussels to punch buttons out of the shells also led to their decline. Many of the common names of mussels in Minnesota are based on their appearance with fun names such as, monkeyface, wartyback, winged maple leaf, pistolgrip, and deertoe to name a few. 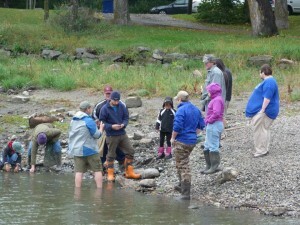 The group then moved down to the river to get their feet wet for the mussel ‘hike’. There is a gravel/sand bar along Memorial Park that is scattered with a fair amount of shells. The search was on for live mussels in the channel and gather shells for Bernard to identify. 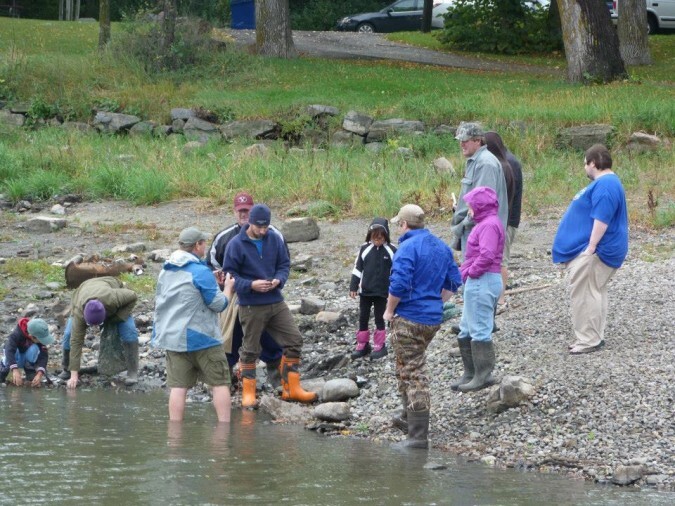 There was a lot of excitement when a female “gravid” (pregnant) pocketbook mussel was found. Bernard pointed out the swollen gills that contain the larvae. An interesting fact about the life cycle of mussels is that they require fish gills as a host for the larvae. Certain species of mussels require certain species of fish. When the mussel is ready to release the larvae, the shell opens with the swollen gills, the right fish comes along and bites the gills, and the microscopic larvae are released. They are shaped like little grapple hooks and their “job” is to hook onto the fish gills where they live for a short time before releasing themselves to drop to the bottom of the channel and begin life as a mussel. The pocketbook mussel that was found also has a fleshy lure shaped tissue that it waves about in the water to attract the fish, if you google mussel lures you should be able to find a fascinating video of this live action! Because of fish being an integral part of the mussels life cycle, the recent removal of dams on the Minnesota, Chippewa and Pomme de Terre rivers increase the possibility of more mussel diversity in these river systems. There was quite an assortment of species that were found by the group which Bernard identified. The species included threeridge, pocketbooks, pink heelsplitter, mapleleaf and a few more. Three different shells were found: spike, round pigtoe and fawnsfoot, that give historical evidence of their presence in the Minnesota river, however no live specimens have been found at least since before 1980. It was a fascinating and educational morning. I want to give a huge thank you to CURE for sponsoring the event and to Bernard Sietman for sharing his knowledge and passion. It is good to get out the word about mussels–these are excellent indicators of stream ecosystem health. I counted 16 live mussels (informally, while floating by) in approximately one stream mile while kayaking (or perhaps duck paddling would be a better word for it) on the Pomme de Terre 2 miles south of Morris on September 22.